I've been getting a lot of questions from people asking, “Is Bitcoin a good investment”. There's a TON of speculation right now around Bitcoin, and I want to help you make an informed decision. In this post I'll talk about the basics of Bitcoin, how it works, and if it might be a good investment for you. The best and most simple definition of a Bitcoin is that it’s a virtual form of currency. You can purchase them, only, online and as-to-date, there’s no form of Federal regulation governing them. This unique, border-line ingenious, creation was invented by Satoshi. According to several sources, this programmer initially gave a summarization of the Bitcoin in an academic paper. Once this, “unusual”, concept was introduced, the “supposedly” Japanese inventor vanished. This has led to speculation that perhaps Satoshi Nakamoto was a fictitious name and may have been more than one inventor. Regardless, since its introduction to our virtual driven society, it has taken its own lane. So now, let me give you my “generic” version of how Bitcoin works. There is a process called “mining”, and not the kind in the hills of West Virginia. The Bitcoins are hidden within a rather complicated, encrypted computer program. You have to solve mathematical issues in order to obtain one. The longer it takes to conquer one, the more valuable the currency. Now, for those of us such as I, that’s sometimes a math misfit and technically challenged, there is help. You can actually start with Bitcoin when you install a Bitcoin wallet. Once you’ve downloaded this app, you’re given a Bitcoin address and are instructed on the procedures. Bitcoins are not pseudo anonymous and can easily be transferred anywhere in the world. One case in particular is the Silk Road case, from a couple of years ago. Bitcoins were use to purchase drugs, guns and other items in that genre. It was a bustling business until they were busted. When that happened, the value of the Bitcoin plummeted. However, that isn’t the present day situation. This form of digital money has fluctuated from $1 to $2 dollar in 2011, to now over $500. Since Bitcoin is a new technology with HUGE potential, many people are jumping on the bandwagon thinking, “I'll risk a little bit and just hold to see how high Bitcoin can go”. This is no different from the attitude of people that buy crappy penny stock companies betting they'll make 10,000% in a short period of time. Anytime you have a new idea or investment vehicle flooded with money, it almost always produces a bubble. We saw this in the stock market crashes of 2001 and 2008, the housing crash of 2007, and many other examples in recent history. 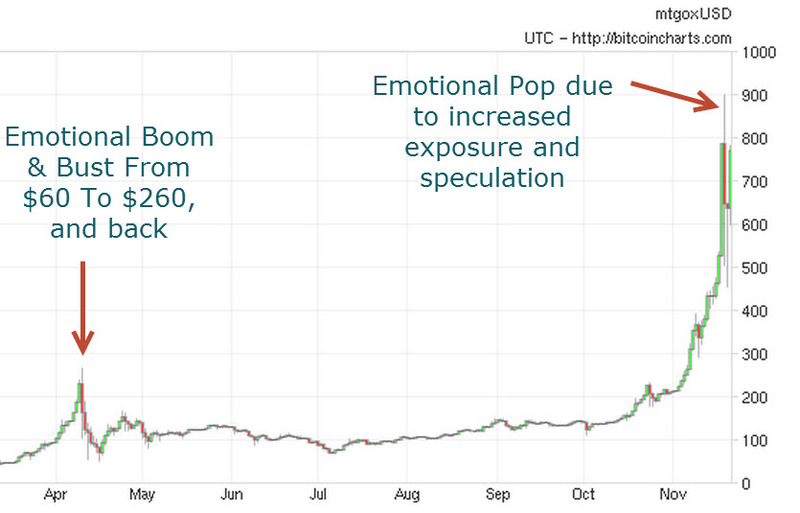 To me, the Bitcoin chart patterns are reeking of a possible bubble. However, the price of Bitcoins could go WAY higher than people might anticipate. The main attraction to Bitcoin is the frictionless (and cheap) transactions and the global presence with no current government oversight. If Bitcoins actually start to take over as a trusted main form of currency, then the value of a single Bitcoin could become millions of dollars. So why am I not jumping all over this? It's very simple – risk & reward. Unlike Gold or a fiat currency like the U.S. Dollar, there's a lot of unknowns about Bitcoins. Who's to say a hacker or government regulator won't bring the whole system down in a single day? What if something more technologically advanced comes along. There are already some options that don't require mining. I just don't have enough confidence that Bitcoin is THE form of currency that's going to dominate all other current and future forms of exchange for goods and services. However, I'm not saying it's not worth a high-risk speculative play. I just wouldn't bet the farm on it. 1. Are you comfortable buying something that's already increased in price 5,000% – 10,000% in the past 12 months? 2. Do you accept all the risks of Bitcoin, and would you survive another day if Bitcoin's value went to ZERO tomorrow? 3. Are your primary investment goals fully funded before putting “play money” aside for super-high-risk gambles? Seriously, if you can't answer a strong “Yes” to those 3 questions, then forget about Bitcoin and focus on something that's showing promise NOW. In my opinion, there are MUCH better places to put your investment capital right now. Sure, you could “throw some money at the Bitcoin market and see what it does”, but doesn't that sound like everybody during the real estate boom of 2005? How did they end up?